Switches between video sources smoothly without distortion, black screens, or audio noise. 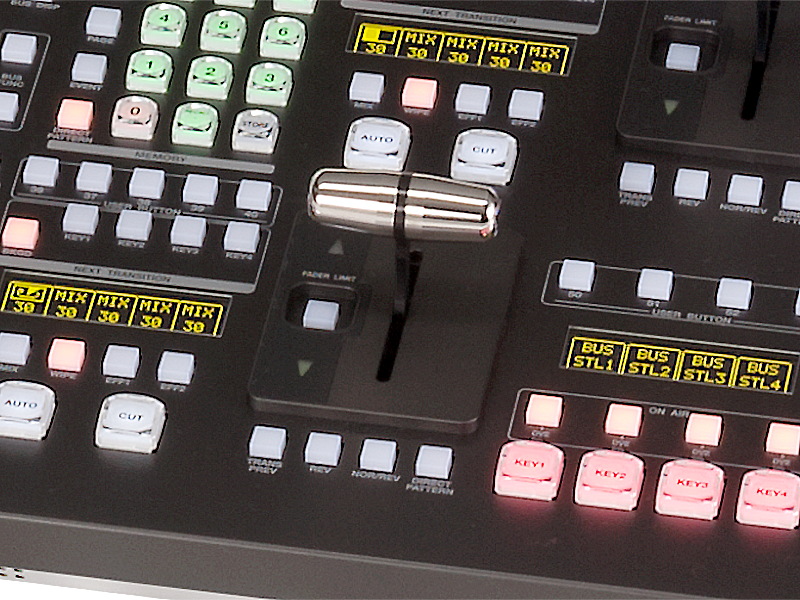 A T-bar on the control panel enables switching from a preselected preview video signal to the program video. To create a certain effect, transitions can also be held midway. Control panels feature two rows of buttons, corresponding to the number of inputs. Bottom buttons (green when selected) are used to preset video, preparing the video for program output. Top buttons (red when selected) are used to select program output video. The buttons are pressed for direct selection of preset or program output. Slide the T-bar on the control panel to switch the selected preset video to program output. The program output that had been playing is now available as a standby preset. When there are more input signals than buttons, modifier keys such as Shift are used. Control panels also feature Cut and Auto buttons. 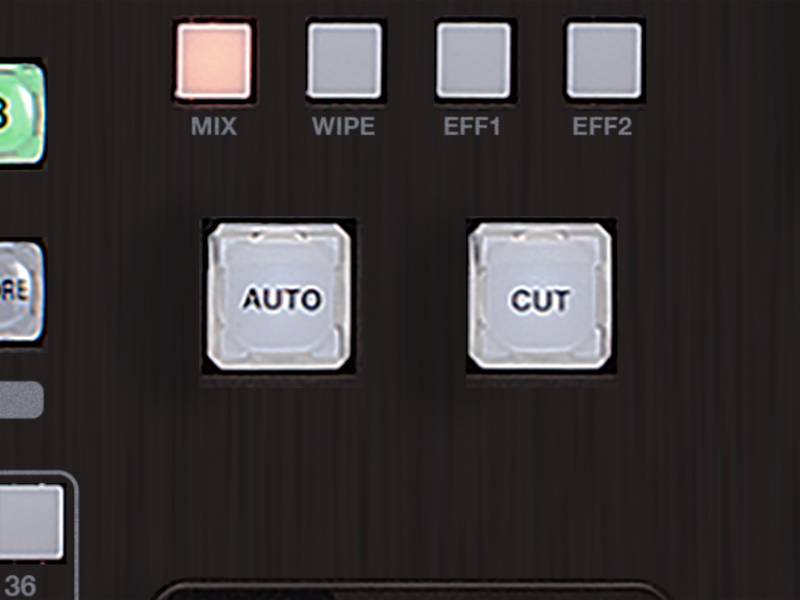 Pressing the Cut button switches the preset video to program output, replacing the current program output with preset video. The Auto button applies preconfigured transition effects for a predetermined duration, switching the preset video and program output. The more M/E (mix/effects) units, the greater your freedom in combining two video signals, adding effects, and using keyers for compositing. Each M/E enables another layer of composited video. M/Es described as half M/Es (with a value of .5) are able to composite preset or program video in the background at the final stage. As for audio processing by video switchers, switchers demultiplex (demux) embedded audio signals to separate them from video signals. This processing is much less intensive than video processing, which may lag due to complexity and the heavy processing load. To compensate, a delay is added at the end of audio signal processing, to synchronize audio and video as they are multiplexed (muxed), to embed the audio before playout. Keyers are system components that produce composite images. Chroma keyers remove color, based on a certain color component, and luminance keyers do the same for luminance. Two signals are produced: fill signals that will form the background, and key signals that reduce a specific color or luminance by applying a mask. Common digital video effects that can be added include resizing, moving, or rotating the input video. Examples of special effects include page curls and page turns. Combining signals and adding effects are referred to as upstream processes. Downstream processes occur after M/E output. DSKs are keyers for adding graphics as users watch a screen, immediately before playout. Multiple cables must be used in some cases when transferring 4K UHD video over SDI. For example, four cables are used to transfer 4K UHD video over 3G-SDI. In this situation, two transfer formats are available: square division and two-sample interleave (SQD and 2SI, respectively). 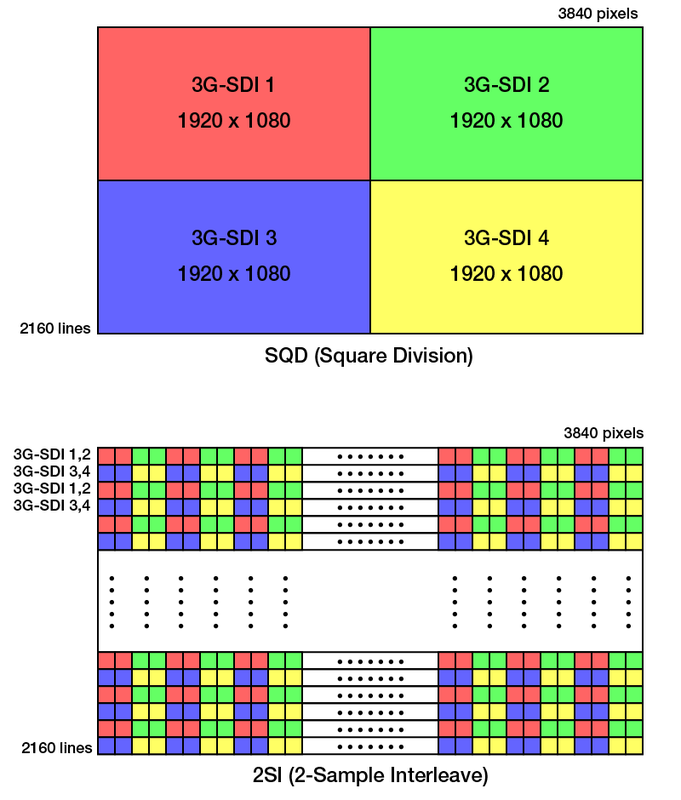 SQD divides each 4K frame into quadrants, with each quadrant transferred over a separate cable. 2SI forms a line with the left and right screens connected. Samples that consisting of two pixels are transferred one at a time. The first and second SDI cables carry odd-numbered lines in alternation, two pixels at a time, while the third and fourth cables carry even-numbered lines.